Remember the most recent time when you found yourself in a state of panic to meet a tight deadline or to deliver to a very demanding client, or when you were in a rush to finish a task to get to the next one on the list? Now, clearly see yourself in this situation. Think about what was going through your mind, what was happening in your body. Perhaps your heart was beating very fast, or you broke out in a cold sweat. Maybe you could feel your blood pressure rising, and your muscles tensed up. Maybe you experienced all of these symptoms. These are typical physiological symptoms of going into a fight-flight response to a situation where the mind identifies danger or perceives a threat. When we, as human beings, still lived in caves the primary threats were from wild animals and natural disasters so the fight-flight mode was necessary for survival. In modern living however, this same fight-flight response is triggered by traffic jams, rushing from place to place, meeting tight deadlines and so on. As this happens on a daily basis, it quickly leads to stress and burn-out – when your mental, emotional and physical energy becomes depleted. As stress builds up, it inhibits the free flow of energy and information throughout your system. The more stress accumulates, the less efficient the mind and body operates. 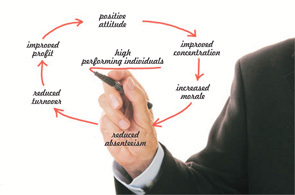 Becoming aware of your stressors through being Mindful and knowing how to manage your own energy, helps the body support greater balance and vitality, and ultimately improves your overall wellbeing and work productivity. Tip 1: Become aware of what’s happening “in the present” – in your body, your mind and the situation around you. You can practice Mindfulness by meditating; engaging all of your senses and focusing while you do every-day tasks such as eating, household chores; or focusing on the soles of your feet as you walk. Although breathing is an automatic function of the body, when you focus attention on your breath, it allows the mind to release distressing thoughts and emotions. This is a key starting point for relaxing, de-stressing and optimising your energy. The slower your rate of breathing, the more control you have over your mind – your rate of breathing and your state of mind are inseparable. The mind follows the breath, and the body follows the mind. Start by noticing how you are breathing – it may be fast, it may be slow, it may be shallow or deep. Just take note – without judgement. Observe the thoughts that may enter into your mind without analysing or engaging with them. Keep bringing your focus back to your breath. 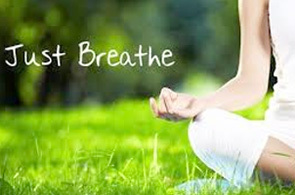 Then, consciously slow down the breath, making each breath long and deep – notice how that makes your body feel. Tip 3: Move your body to alter your state of body and mind. Many of us sit in front of the computer most of the day. This often leads to muscle spasms, back problems, sluggish energy, eye strain, irritability and poor concentration. This in turn leads to poor productivity, stress and burn-out that become the seeds of illness. A few basic movements while you’re sitting in your office chair or standing at your desk can help to get your blood circulation going, increase your flexibility, relax and loosen tight muscles, and release tension. Consciously moving different parts of your body, while breathing long and deep, can also calm and centre you when work starts to get the better of you. Twisting your upper body from side to side, from the waist. This will ultimately increase your productivity and positively influence your relationships in the workplace. With Mindfulness, Breathing and Movement you can reduce stress by Managing your Energy @ Work. Glynis Overmeyer is a change facilitator, energy healer and spiritual teacher. 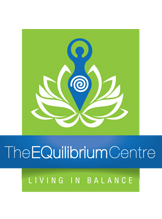 She incorporates principles of change management, Kundalini Yoga, Reiki and Emotional Freedom Techniques in her work with individuals and groups. She is passionate about assisting people to empower themselves to find Happiness, Health and Truth. She believes that people are happier, healthier and more effective in life and in work when they are able to consciously breath, quiet their minds and manage their emotional responses through flexing and strengthening all aspects of Self.